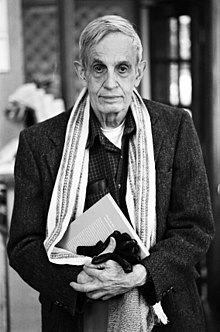 John Forbes Nash, Jr. (June 13, 1928 — May 23, 2015) was an American mathematician, who shared the 1994 Nobel Memorial Prize in Economic Sciences with game theorists Reinhard Selten and John Harsanyi. His works in game theory, differential geometry, and partial differential equations have provided insight into the factors that govern chance and events inside complex systems in daily life. His theories are used in market economics, computing, evolutionary biology, artificial intelligence, accounting, politics and military theory. A less obvious type of application (of non-cooperative games) is to the study of cooperative games. It is unnecessarily restrictive … to assume any transferability or even comparability of the pay-offs … to different players. Any desired transferability can be put into the game itself instead of assuming it possible in the extra-game collaboration. A less obvious type of application (of non-cooperative games) is to the study of cooperative games. By a cooperative game we mean a situation involving a set of players, pure strategies, and payoffs as usual; but with the assumption that the players can and will collaborate as they do in the von Neumann and Morgenstern theory. This means the players may communicate and form coalitions which will be enforced by an umpire. It is unnecessarily restrictive, however, to assume any transferability or even comparability of the pay-offs [which should be in utility units] to different players. Any desired transferability can be put into the game itself instead of assuming it possible in the extra-game collaboration. The writer has developed a “dynamical” approach to the study of cooperative games based upon reduction to non-cooperative form. One proceeds by constructing a model of the preplay negotiation so that the steps of negotiation become moves in a larger non-cooperative game [which will have an infinity of pure strategies] describing the total situation. This larger game is then treated in terms of the theory of this paper [extended to infinite games] and if values are obtained they are taken as the values of the cooperative game. Thus the problem of analyzing a cooperative game becomes the problem of obtaining a suitable, and convincing, non-cooperative model for the negotiation. The writer has, by such a treatment, obtained values for all finite two-person cooperative games, and some special n-person games. We give two independent derivations of our solution of the two-person cooperative game. In the first, the cooperative game is reduced to a non-cooperative game. To do this, one makes the players’ steps of negotiation in the cooperative game become moves in the noncooperative model. Of course, one cannot represent all possible bargaining devices as moves in the non-cooperative game. The negotiation process must be formalized and restricted, but in such a way that each participant is still able to utilize all the essential strengths of his position. The second approach is by the axiomatic method. One states as axioms several properties that it would seem natural for the solution to have and then one discovers that the axioms actually determine the solution uniquely. The two approaches to the problem, via the negotiation model or via the axioms, are complementary; each helps to justify and clarify the other. I think madness can be an escape. If things are not so good, you maybe want to imagine something better. In madness, I thought I was the most important person in the world. As a graduate student I studied mathematics fairly broadly and I was fortunate enough, besides developing the idea which led to "Non-Cooperative Games," also to make a nice discovery relating to manifolds and real algebraic varieties. So I was prepared actually for the possibility that the game theory work would not be regarded as acceptable as a thesis in the mathematics department and then that I could realize the objective of a Ph. D. thesis with the other results. People are always selling the idea that people with mental illness are suffering. I think madness can be an escape. If things are not so good, you maybe want to imagine something better. In madness, I thought I was the most important person in the world. He was always full of mathematical ideas, not only on game theory, but in geometry and topology as well. However, my most vivid memory of this time is of the many games which were played in the common room. I was introduced to Go and Kriegspiel, and also to an ingenious topological game which we called Nash in honor of the inventor. As I said, I spent a great deal of time in the common room, and so did Nash. He was a very interesting character and full of ideas. He also used to wander in the corridors whistling things like Bach, which I had never really heard before — a strange way to be introduced to classical music! I saw quite a bit of him over those years and I also became interested in game theory, in which he was an important contributor. He was a very interesting person. When Freeman Dyson, the physicist, greeted John Forbes Nash, Jr. at the Institute for Advanced Study one day in the early 1990s, he hardly expected a response. A mathematics legend in his twenties, Nash had suffered for decades from a devastating mental illness. A mute, ghost-like figure who scrawled mysterious messages on blackboards and occupied himself with numerological calculations, he was known around Princeton only as “the Phantom.” To Dyson’s astonishment, Nash replied. He’d seen Dyson’s daughter, an authority on computers, on the news, he said. “It was beautiful,” recalled Dyson. “Slowly, he just somehow woke up.” Nash’s miraculous emergence from an illness long considered a life sentence was neither the first, nor last, surprise twist in an extraordinary life.